On this day one year ago my brand new husband and I had just touched down in San Francisco to begin our two-week Northern California honeymoon (you can’t rush these things. I knew I’d get around to blogging about it eventually). We had a relatively long engagement, which mean lots of time to discuss and research where we might want to honeymoon. Honeymooning in July, we knew we didn’t want to go somewhere hot like Mexico and decided to explore something in the U.S. At first we thought some quiet town on the East Coast might be nice and I found a great B&B in Maine. Then I realized the restaurant in the building didn’t offer a single vegetarian item. 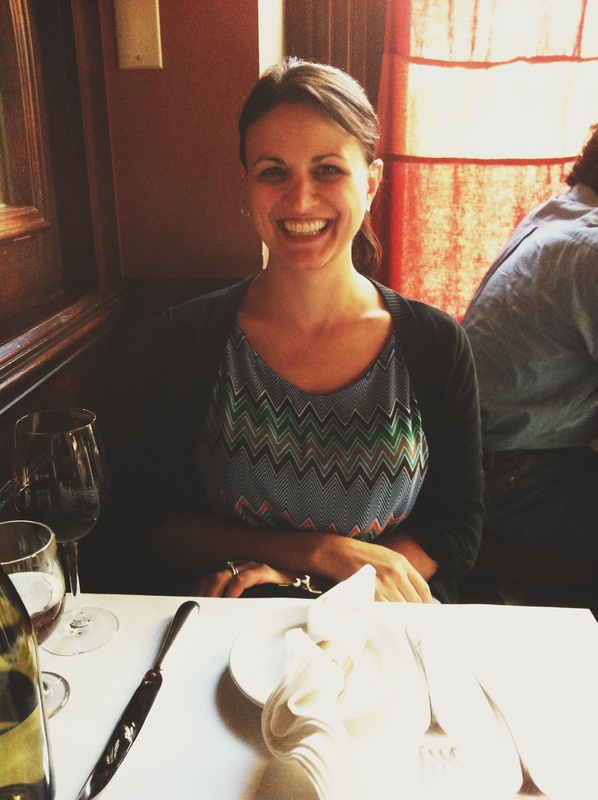 Restaurants and food research is always first on my list when it comes to a trip we take. I’ve always got a list of places I’d like to go. As a person who just plain loves food and cooking, not to mention the fact that I’m a personal chef, it’s no surprise that it would be an important part of our honeymoon. 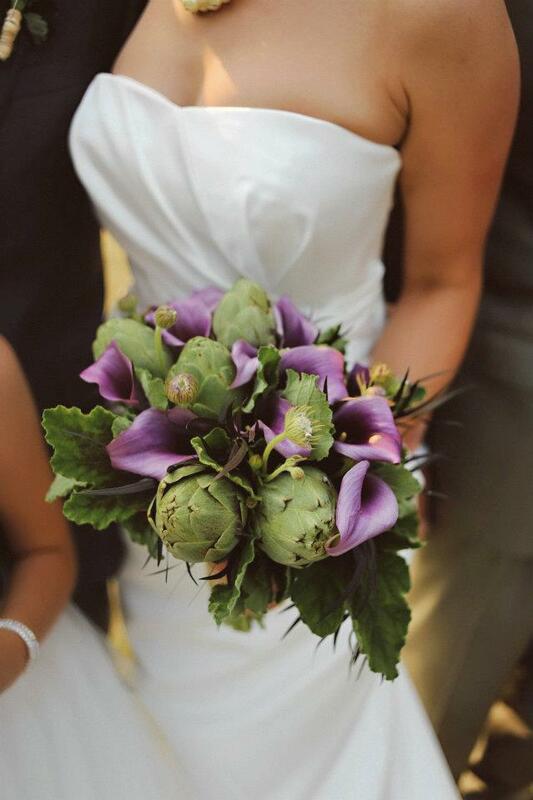 It was a part of our wedding too (I know I’ve posted before about my love for artichokes — my bouquet may prove it). We had a 90% vegan wedding (all except for cheese for the pasta, dill dip for veggies and real whipped cream for the strawberry shortcake) and our favors were homemade vanilla and coffee-infused bourbon. So, I looked into various cities that had great veg representation. Then I got my weekly e-mail from VegNews Magazine with a link to an article about the country’s first vegan resort. I asked my squeeze if he wanted to honeymoon at a vegan resort in Mendocino and he didn’t hesitate for a second. We reached out to a few West Coast friends for tips and got so many great recommendations, we decided to spread our tour de North Cali over two weeks and hit four main places, eating our way up the coast from San Francisco. We flew into San Francisco July 2, arriving at lunch time. I had the latest copy of VegNews with me on the plane, which happened to have an article or ad about SF veg spot Herbivore in it. We picked up our little red Prius and headed straight to the location on Divisadero. We were starving and got the hummus appetizer then giant burritos with side salads. We totally stuffed ourselves and it was oh, so good. We tried to go back two days later on our way out of town, but they were closed for the Fourth of July. The only place I HAD to go to during our 48 hours in the city was Millennium, a white tablecloth, vegan restaurant that I had read so much about. Beyond that, I didn’t much care what we did in the city. We decided to look into it the next day, checked into our hotel and headed out for D to get a haircut. 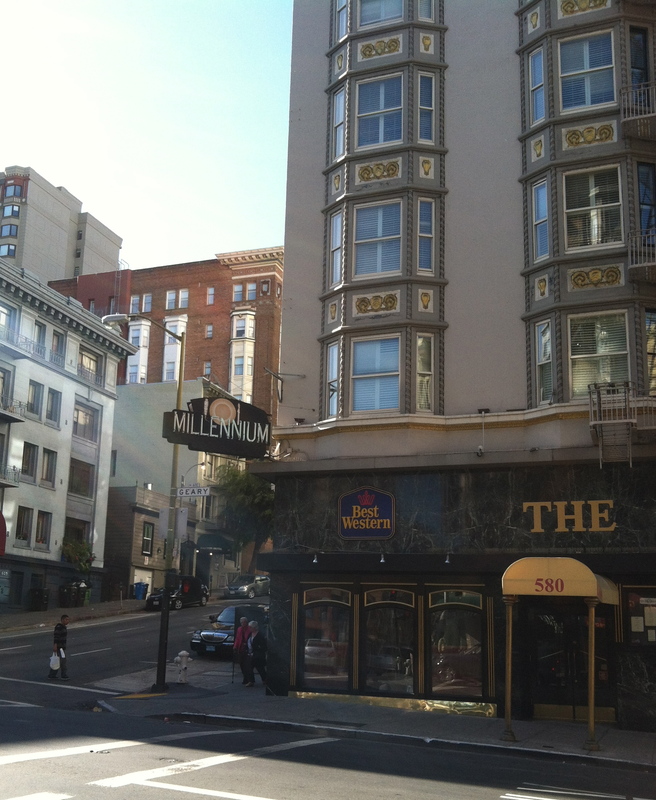 The hotel front desk staff had recommend barber shop Public on Geary, where they hand you an ice-cold can of beer when you walk in. As we exited, what did I see RIGHT ACROSS THE STREET? Millenium. We walked in and made a reservation for the following night. Day 2 in the city we were up bright and early, being on Michigan time still. We were showered and walking around the city by about 7 a.m. It was pretty cool to be in the city when it was relatively quiet. My trusty Yelp ap led us to the Honey Honey Cafe and Crepery not far away. Honestly, I don’t remember what I had to eat. I mean, come on — it was a year ago! But I think we were both happy with what we got. I do remember fresh juice that was delicious. Fortunately it was several hours until our reservation at Millennium. 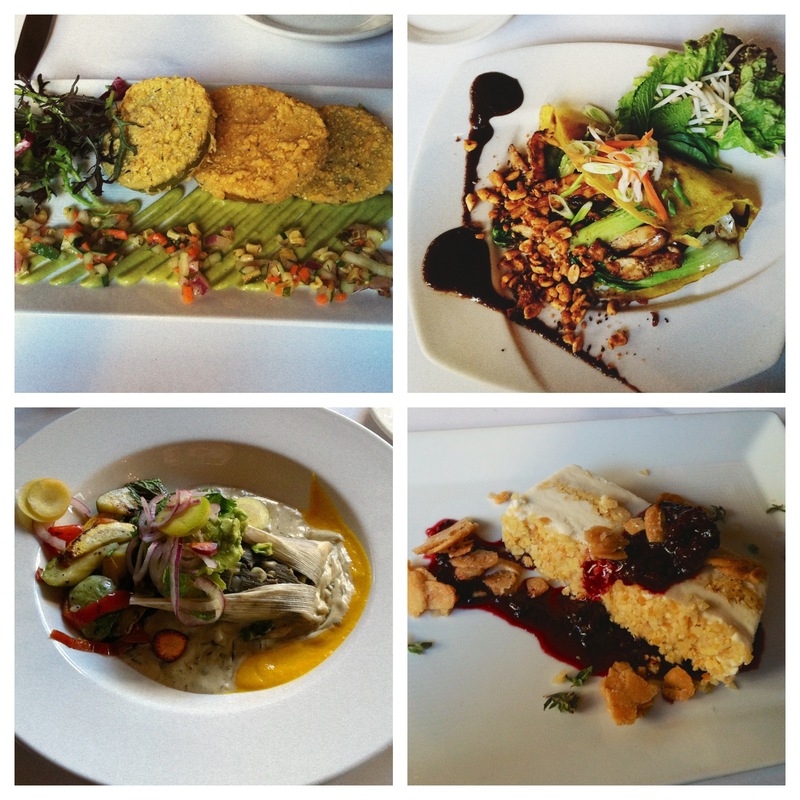 I was really, ridiculously excited to go to a “fancy” restaurant that was all vegan. We could get anything on the menu — and you know I was saving room for dessert. We had a lovely table for two near the front. See how happy I was to be there? We had a terrible time deciding what to get. Everything sounded so good! I think we narrowed it down and asked for guidance from our server. We started with Fried Green Tomatoes. 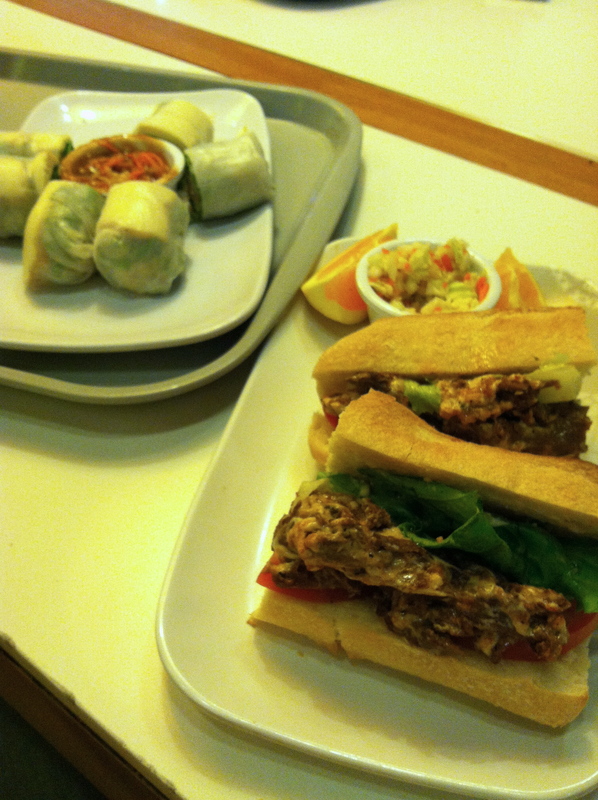 We split two entrees — a Vietnamese rice flour crepe with bok choy, peanuts, tofu and other deliciousness and a tamale. 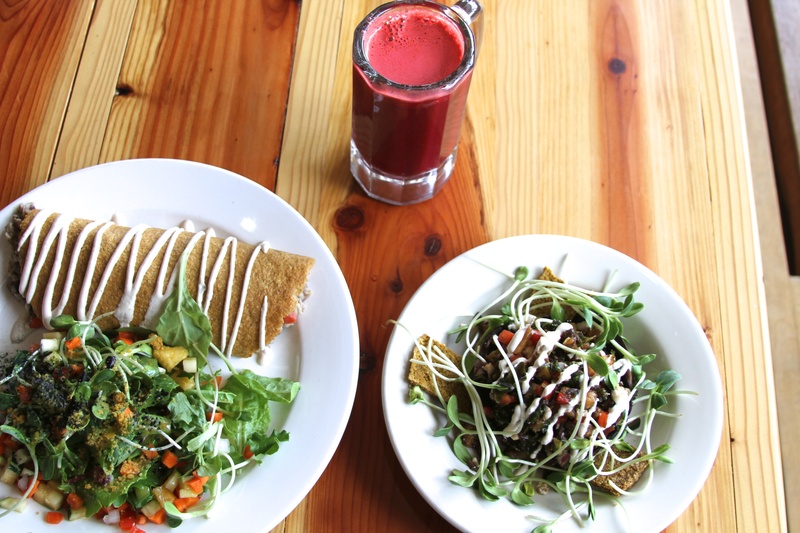 They were both amazing, but I have to admit I think about that Vietnamese crepe regularly. I really need to get back there for that. For the life of me I can’t remember exactly what we had for dessert, but doesn’t it look good? It was! We still call this the best meal either of us ever has eaten. The next morning was the Fourth of July and we had a tough time finding a veg-friendly breakfast or brunch that was open. Eventually we found ourselves at Tangerine in the Castro, which apparently now is closed. By the time we got to Tangerine, we were starving and frankly, a little cranky. Unfortunately, we would only get crankier. D ordered the oatmeal but that sounded too boring for me. I had been eating so much delicious flavorful food for days and couldn’t stop now! At this time last year, I still ate dairy and eggs sometimes. I decided to get the Florentine Benedict — I’m a sucker for hollandaise. 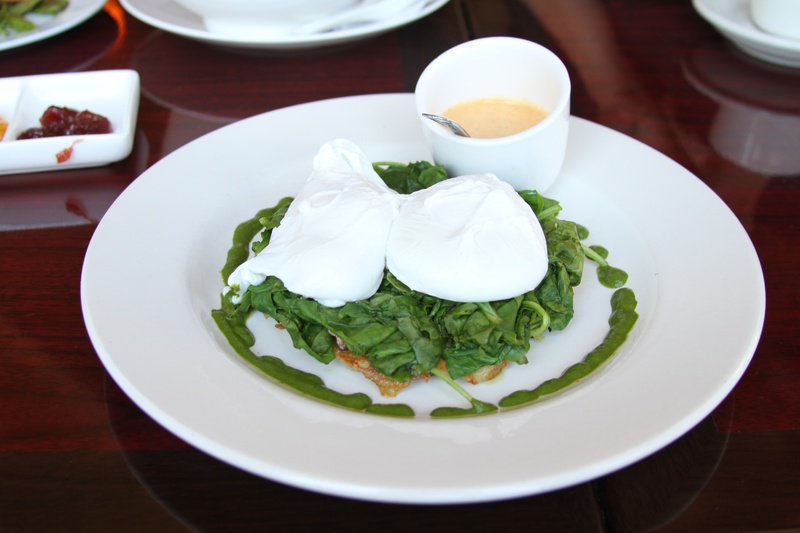 It arrived looking beautiful with two perfectly poached eggs on top. I was starving and dug in, devouring it. I like to joke that it was some kind of vegan karma to punish me for eating eggs and dairy that day that I made a pretty gross discovery when I was approaching my last few bites of breakfast. You can just barely see it in the photo above if you know what to look for, but allow me to magnify it for you. 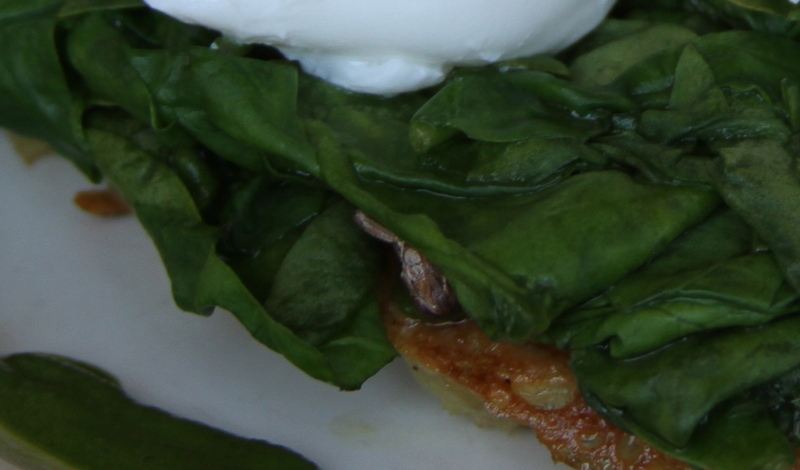 Right there under the spinach was a gray, whole grasshopper. A GRASSHOPPER. I’m not going to lie, it totally turned my stomach. I can handle a lot, but it took me a while to recover from that (I know, I know, I didn’t actually EAT the little guy, but it really grossed me out). Unfortunately, they weren’t very cool about it when we expressed that we didn’t think we should have to pay for breakfast. Accidents happen — I get that. But, needless to say, I don’t plan on returning to Tangerine, whether it reopens or not. According to the mixed reviews posted on Yelp, I’m not the only one. We then explored nearby Buena Vista Park, which we stumbled upon en route to Tangerine, and hit up a few stores and architectural spots in the city that were truly amazing. As we cut through Golden Gate Park to see Palace of Fine Arts, we recalled the associate at Levi’s telling us about a vegan and raw place called Judahlicious where her roommate would get her takeout. (It was pretty easy to remember the name of the place, considering the name of my man’s former band). We headed there for lunch and were so glad we did. It was well worth the drive to the beach and showed us a part of San Francisco we never would have gone to otherwise. 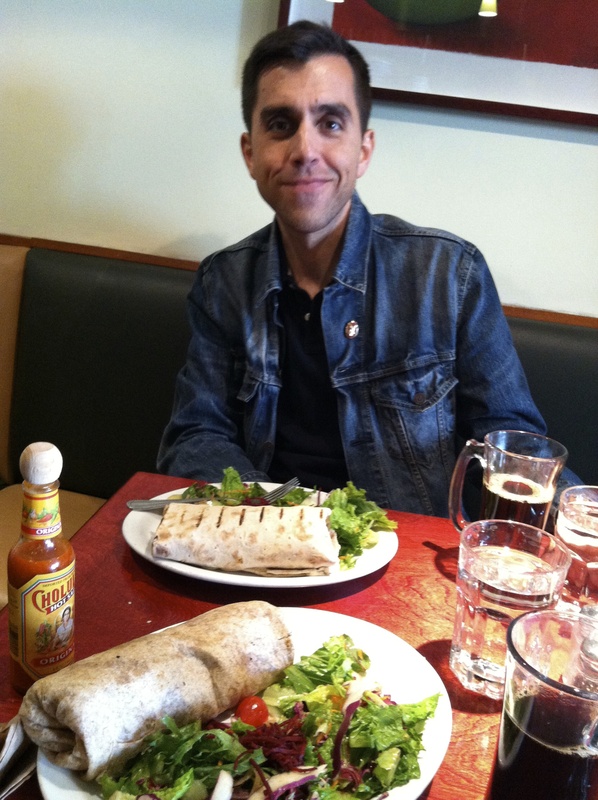 D got the burrito (left) which included rice, beans, veggies, cashew cream and a raw flax tortilla. I got the raw special (right) a marinated portobello mushroom bowl. 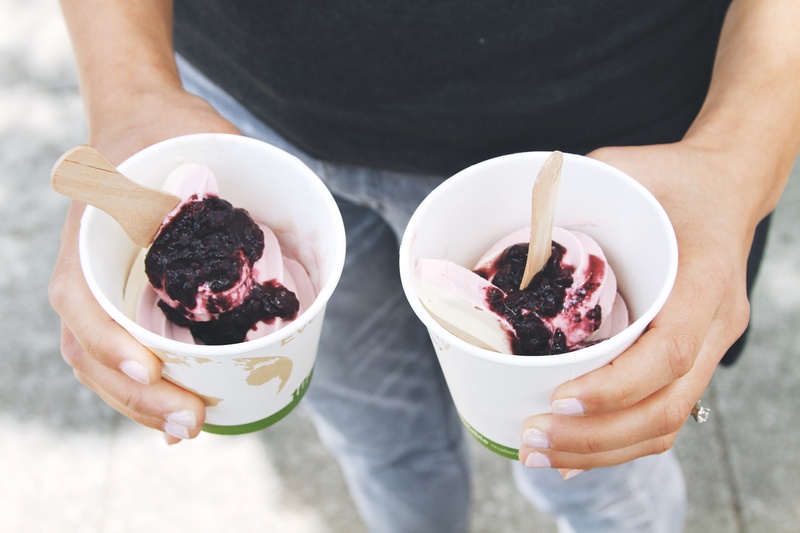 We both got fresh juices and how could we not take advantage of their Fourth of July red-white-and-blueberry vegan soft serve? We then headed back through the park and into Downtown. Although I had driven down Lombard Street several years ago on a visit, my husband had never heard of it, so we attempted to swing by. It turns out, the Fourth of July is not the day to do that. Though I wanted to show him the wharf too, we decided it would have to wait for a future visit to the city and headed north. As this was only the first 48 hours of our honeymoon and it’s quite lengthy, I’ll consider this Part 1. In Part 2 I’ll tell you about our adventures in Jenner, Gualala and the destination that got us to California in the first place, The Stanford Inn.